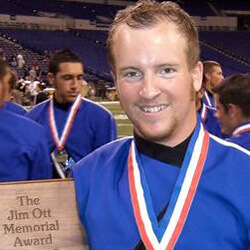 Perry Reid, 20 Glassmen 2008-2009, Blue Devils Trumpet 2010 How did you choose your corps? For both places I've marched the corps kind of chose me. I heard about an open trumpet spot at the Glassmen two weeks before I graduated from Carmel High School, so I called Keith Hallas over at Glassmen and after a weekend of rehearsal and the audition I got the spot. As for the Blue Devils, I like many other kids grew up idolizing the entire organization. When you think of excellence in the drum corps activity, the Blue Devils are at the top in every category, and that's where I wanted to be. What was the experience like the first time you auditioned for a corps? I was really, really nervous actually. This audition was something I had been working pretty hard at for a while, and it really hit me after I got out of the car. I walked into the site full of people I didn't know, and I realized that I had two choices. I could either do my best and deal with whatever obstacles came my way, or I could do the exact opposite. The staff was nice, and we went through a lot of the warm-up exercises and even some show music. It was also weird to march again, and learning new exercises while being evaluated was intimidating. So be ready for that! What's the best way to prepare for an audition? The best way to prepare is PRACTICE (Surprised?). Practicing and being comfortable with your solo piece or corps' exercises is essential. What practicing (and memorizing if possible) does for you is builds a baseline, or "default." When you're under the pressure of an audition you won't freeze or hesitate when you really know what is going on. Start hard passages very slowly, and bump up the tempo four to six clicks a day till the audition. Also be able to play it a little faster than marked in case the drum major had too much Starbucks! Another great thing to do at least two weeks before you audition (but better late than never) is to perform in front of people. Grab anyone you can (but preferably another musician) and perform your material in front of them. This will get you used to performing with people watching, and the more comfortable you can make yourself weeks before the audition makes you that much more prepared. What would you say to someone who is unsure whether or not to audition for a drum corps? Go for it! Drum corps is the most rewarding thing I've ever done with my life, and it can be with yours too. Who doesn't want to come back from the summer with chops of steel, a rockin' tan, and more in shape than Richard Simmons? Drum corps takes a lot of work, sacrifice and dedication, but I've seen people from literally any background you imagine have the time of their lives with this activity. Do it while you can! Also, if you are on the fence but worried that the corps you really want to march with "would never accept me," get that out of your head now! If I was told my freshman year of high school that I'd have marched three (and soon to be four and five) years of drum corps, play high note solos in front of thousands, make the Blue Devils and win a World Championship, I would have said there is no way that's possible. But it happened because I decided to make it happen. By auditioning for your favorite corps, you are taking the first step to make it happen for yourself. Any other advice? One thing I've learned from many college auditions (I'm a trumpet performance major) and corps auditions is that the people who you audition for want to see you do well. The last thing the music staff wants to hear is several hours of bad auditions. They are there to help you succeed and they genuinely want to see you do well. So be confident! If it's your first time auditioning for corps, or your first experience at someplace new, chances are you won't know many people from the corps. Be friendly, smile, hold the door open for others, say please and thank you, and try to learn a few names (staff names, drum majors, and section leaders are good ones to know!). Don't be afraid to ask questions to the veteran members of the corps either. When you go into your individual auditions, whether it's color guard, music, front ensemble, or drum line, it looks really good to smile and to shake the hands of those evaluating you. It shows them that you are comfortable with yourself and speaks of your level of excellence as a musician. And lastly, nobody will have a perfect audition. I made several mistakes in my audition with the Blue Devils. What matters is your attitude and ability to learn quickly. If a staff member makes a suggestion, try to incorporate that in your playing right away. A good corps member isn't perfect, but can learn to be very quickly. Learn more about corps audition dates, locations and additional info.